Rajasthani Puppet, Puppet Show, Rajasthani Puppet Show Events. The puppets in Rajasthan are one of the popular sources of entertainment in the state. 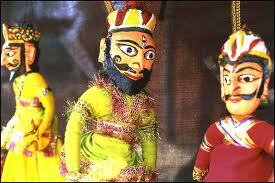 The art of puppetry is practiced by a community of agricultural laborers of Rajasthan. These people have been associated with Rajasthani string puppetry to carry forward their traditional occupation.They travel all through the countryside to exhibit their skills.This art also know as "kathputli".